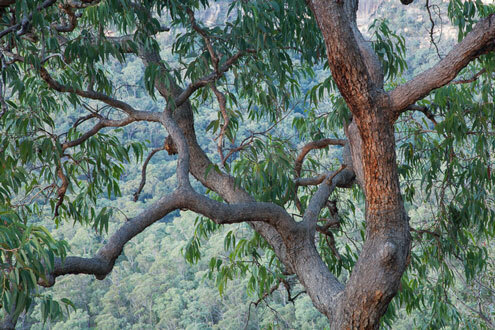 Gumtrees: are they the ecological essence of Australia? 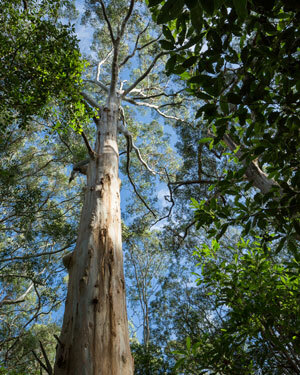 More than 700 species of Eucalyptus dominate the continent’s bushland like no other genus on any other continent – from Tasmania to the high alps, the deserts and tropical savannahs. A few have even made it into New Guinea, Indonesia and as far as the Philippines. The mighty pillars of Eucalyptus regnans (Mountain Ash) in Victoria and Tasmania are the largest flowering plants on Earth, while the humblest eucalypt is the alpine shrub E. vernicosa (Varnished Gum), found only in Tasmania. River Red Gum (E. camaldulensis) grows across much of the mainland to be the most widespread. Most of the Greater Blue Mountains World Heritage Area (GBMWHA) (about 93 per cent all up) is covered by a vast mantle of eucalypt forests, woodlands and mallee shrublands, with much smaller areas of rainforests, heaths, wetlands and exposed rock. As might be expected from the diversity of the landscape, altitude, geology, soils, climate and fire history, the diversity of eucalypts is also very high. ‘Eucalypts’ include species of the Eucalyptus genus, plus the closely related Corymbia (bloodwoods) and Angophora genera, all in the myrtle family (Myrtaceae). The latest tally (see The Eucalypts of the GBMWHA) puts the number of eucalypt species found in the WHA at 96 – one of the greatest concentrations of eucalypt diversity in Australia, or anywhere on Earth, and hence an assumed centre of evolution for the group. That total doesn’t include at least two species yet to be scientifically described and two other rare species found just outside the WHA (E. copulans and E. gregsoniana). 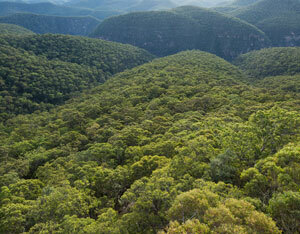 Overall, there are at least 100 eucalypt species in the Greater Blue Mountains landscape. About half of the species are widespread in the region, with three species endemic to the WHA (and therefore well protected) and six others listed as threatened in NSW. GBM eucalypts range from 60-metre giants of the wet forests like the Blue Gums (E. deanei and E. saligna) to gnarled woodland species like Narrow-leaved Apple (Angophora bakeri) and the Scribbly Gums (E. sclerophylla, racemosa and rossii) and to a number of short and multi-stemmed mallees like the common Blue Mountains Mallee (E. stricta) and the rare Faulconbridge Mallee Ash (E. burgessiana). Climatically they range from sub-alpine species like Snow Gums (E. pauciflora) to some of the Ironbarks and Red Gums that favour semi-arid conditions. This variety of trees is an aesthetic treasure trove, with many species of great stature or character and some with spectacular bark colours (especially in the rain) and impressive flowerings. 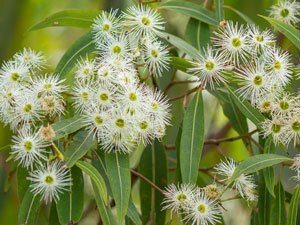 Ecologically the eucalypts provide homes and food for a myriad of birds, reptiles, mammals, frogs and invertebrates. Detailed vegetation mapping of the WHA has classified hundreds of different eucalypt-dominated communities within five broad formations (see Vegetation, Fire and Climate Change in the GBMWHA - 10MB pdf). The diversity of eucalypt-dominated ecosystems and other hard-leaved vegetation is a key reason the GBM was deemed worthy of world heritage listing: the region is one of the best examples of quintessential Australian ‘bush’ and ecosystems.